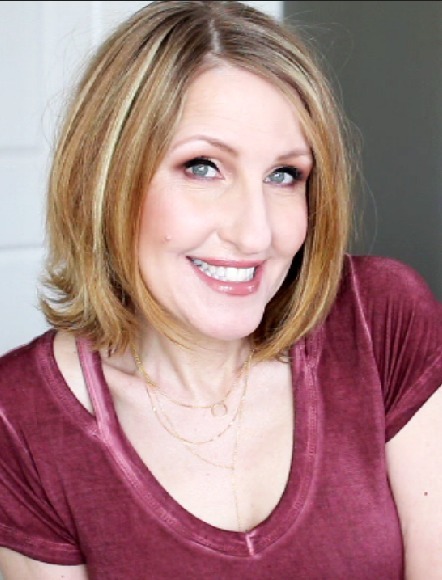 Last week I shared my Grunge plant holder that I created. Before shooting photos for that project, I decided to add a few flowering plants to make it look prettier. These plants were going to be for photo purposes only, as I’m planning on selling this at my Vintage sale. Yeah, I was going to keep it, but I’ve decided to let it go with lot’s of my personal collection. Anyway, while my daughter and I were out running errands, shopping thrift stores, I decided to stop by a local nursery to see what they had as far as flowers. It’s too early to think about outdoor flowers yet, but I was hoping to find something in there greenhouse. As we were walking in the greenhouse I stumbled onto these beauties. 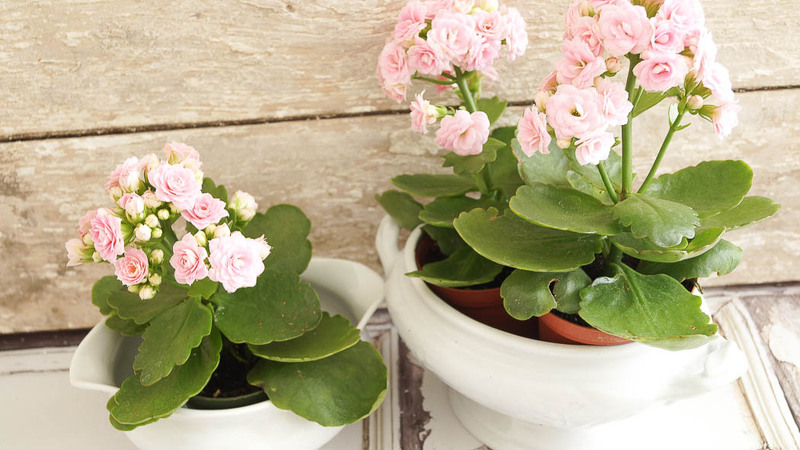 They’re a succulent, the variety is called a double Kalanchoe. 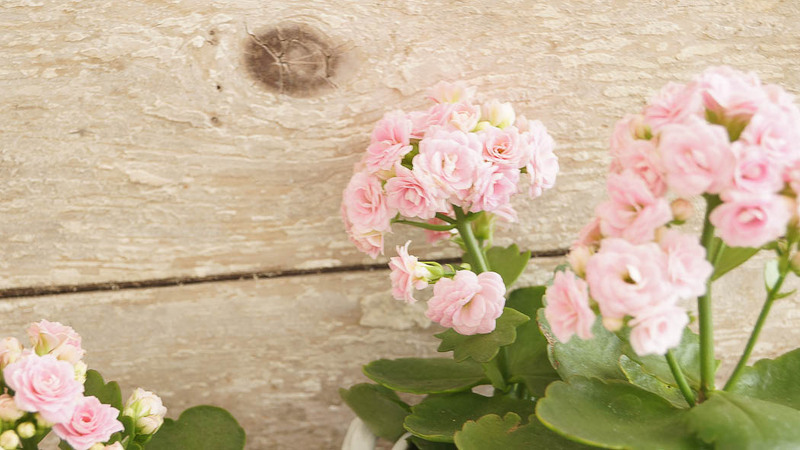 The name Kalanchoe is Chinese word, It sounded like an Indian name. This special variety was discovered in 1980 by Danish and Dutch growers. Well, you know what caught my eye didn’t you, they look like a petite rose and they’re pink! I asked the horticulturalist for advice on how to care for this. She told me that this can be kept indoors or outdoors. In our area of the country this would survive a winter, but could be placed outside in a planter for the summer months. She told me that these succulent plants should only be watered once every 5 days. Then she told me that when I’m watering this plant, I need to water it until the starts draining out of the bottom of the planter. This plant needs good drainage, and she suggested planting each them in clay pots, as you can see I still need to do that, and will be replanting them this week. For now I’ve kept them tucked inside of these white ironstone containers. She added that I need to place pebbles at the bottom of the planter then use light soil for better drainage, this also helps the roots. She warned me about how important drainage is, if this plant sits in water it will die. But, she also said that I could keep each one in a small clay container. If you plant this in a larger container the leaves will get larger. This plant will need to be replanted each spring, which scares me a bit, hope I don’t kill it. Let’s hope I don’t kill this, I’m not the best at indoor plants. If you do keep this indoors, make sure that you keep it away from any drafts. The perfect temperature for this plant is between 60-85. This plant needs lots of natural light to grow, but she also said not direct sunlight, especially in the summer. Which can be a bit confusing, because it does need light, but not direct light. Too much sun the leaves will burn, not enough light, the outer part of the leaves will turn a brownish color. Here’s the interesting part, the less light this plant receives, the more it will bloom. The more light this plant receives , the less it blooms. So, you know what I’ll be doing, since I fell for the blooms on this. Once the flowers start to die off, cut them back, and water less, this will re-flower. What indoor plants to you have in your home? Please share, I’d love to know. Have succulents, some different varieties. We brought hens and chicks with us from KY and still have loads of them, they reproduce like crazy in warm/hot weather. Our hens/chicks left outside in winter and they do well. Usually separate many when it gets warm/hot to other containers. Would love to have some of Kalanchoe succulents. Going to print out instructions you provided and look for some when we go to Lowes, they sure are pretty. Forgot, we have purple larkspur out in front bed that have bloomed 3 yrs in row, so pretty. Have 2 lilac bushes that bloomed 3 yrs ago. Were trying to bloom 2 yrs before/last yr. but weather changed and no blooms. Who knows what will happen this year. They smell so pretty when they do bloom. We worked on 6 drawer dresser gotten last week at our local thrift store for $20.in good condition. Sanded it lightly yesterday, took out two top drawers to put shelf in for dvd player. Will paint it medium gray and get new drawer pulls at Hobby Lobby most likely. Hubs worked on minor repairs and getting it ready to put shelf in. .
Will be our new cottagey tv stand for 50″ tv we got ourselves for Christmas at Sams Club plus a sound bar since my hearing not good. Paid off our car and IRS so can do little more now. Phew does it feel good to have those 2 debts paid off. Been long hard road but finally got to end of that one. Now to do something about my hearing. Aids aren’t cheap and Medicare doesn’t pay for them. Now to figure out what to do with tv stand we were using, am sure something will come up. Thought about taking short legs off, put new longer legs on to make it console table and paint it. Any suggestions? Sorry for rambling on, have great rest of week. That is a gorgeous plant! I don’t do well with any plants except the completely zero-maintenance ones. My daughter has quite a collection of succulents and has a knack for it. Good luck with yours! awesome little plant, have to try it. Inside, not too many live plants, but dried flowers from outside in the garden hydrangeas peonies & grasses, a favorite past time along with pressing them to put in cards & frames. 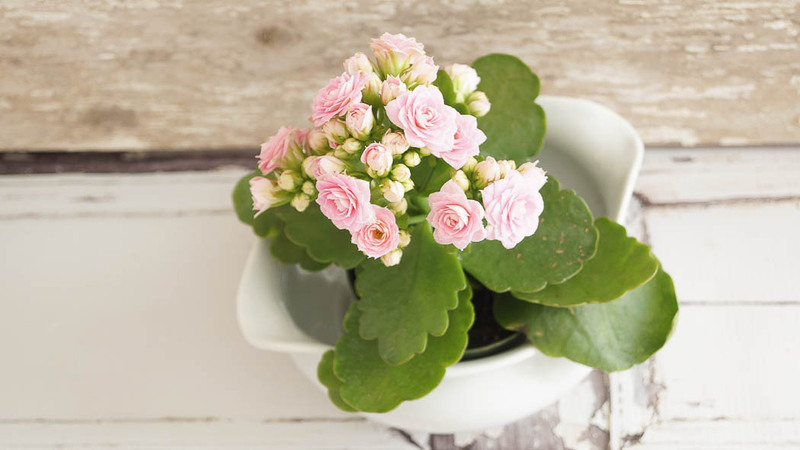 The Kalanchoe is lovely, I also have one at home! 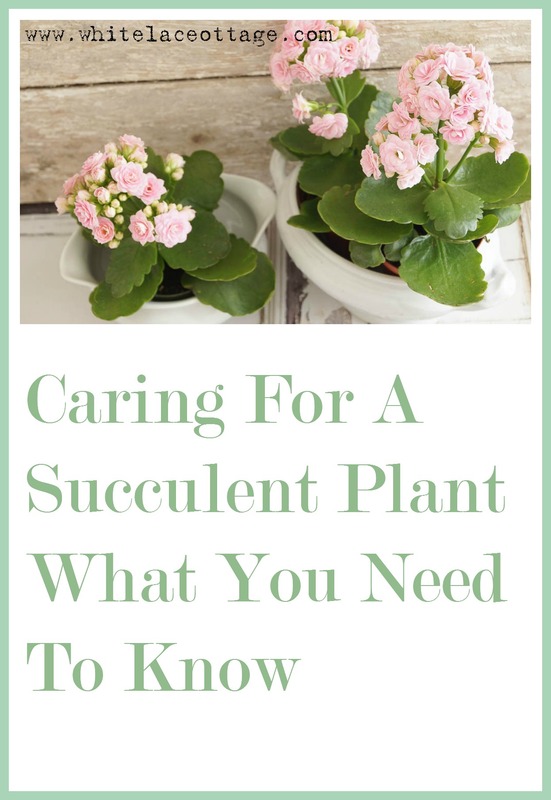 What’s best is that it’s very easy to take care of, as watering once every 5 days makes it perfect for novice gardeners and for everyone who’s not that good with flowers. Yours is gorgeous, mine is red and I kinda like the pink one more.